Mrs. Rosie Bell (Byers) McDaniel, 80, of Morrilton, AR departed this life on Monday, January 14, 2019. She was born in Cleveland, Ar on September 21, 1938 to the late Sam and Ella Byers in Cleveland, AR. 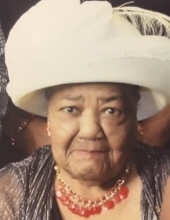 She is survived by two sons, Sam (Sharon) McDaniel of Morrilton, AR and Herbert Byers of Kansas City, MO; two daughters Renea and Diane McDaniel of Morrilton, AR; two granddaughters Anneka Jenkins of Atlanta, GA and Lindsey (Deondra) Swanigan of Fort Smith, AR; three grandsons Jourdan Parks of Morrilton, AR; Herbert Byers, Jr. of Kansas City, MO and Logan McDaniel of Morrilton, AR and a host of other relatives and friends. Funeral services will be held 2:30 pm, Saturday, January 19, 2019 at New Prospect Baptist Church, 3433 Hwy 95, Cleveland, AR. Interment Moore’s Chapel AME Zion Cemetery in Cleveland, AR. Services entrusted to Larry G. Acklin Funeral Home, 307 N. St. Joseph Street, Morrilton, AR. "IN YOUR TIME OF NEED....WE CARE." To send flowers or a remembrance gift to the family of Rosie Bell McDaniel, please visit our Tribute Store. "Email Address" would like to share the life celebration of Rosie Bell McDaniel. Click on the "link" to go to share a favorite memory or leave a condolence message for the family.